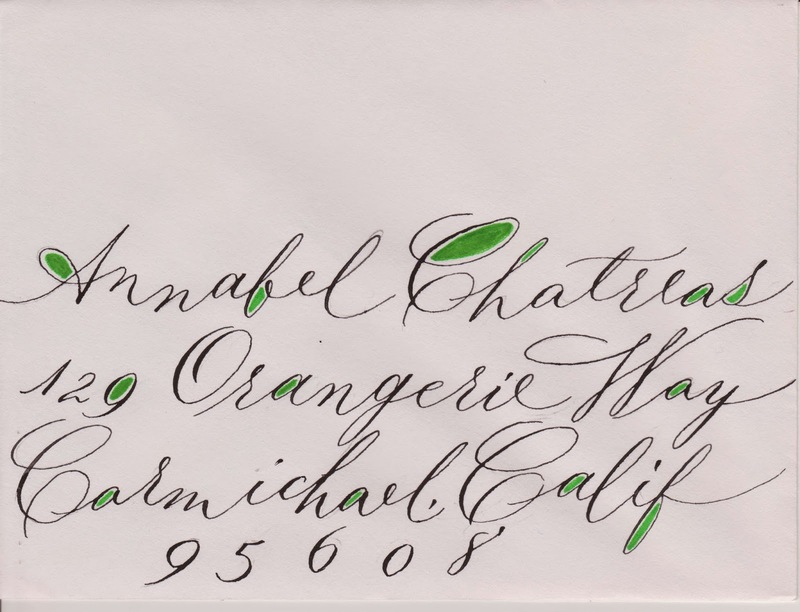 I never planned to do calligraphy for this wedding suite using a Sharpie! The layout inspiration came from a card we saw in a magazine. Lauren decided she wanted a kraft background and the lettering uses Lauren's colors. It took me a lot of experimentation to decide to use the Sharpie for the lettering--Lauren wanted a bold, contemporary look. The invitations will be a modern floral. I'll carrying the Sharpie lettering throughout her suite. I usually don't post my envelopes because they have personal addresses on them. Those I create as "gifts" for others are always my best effort. For my teaching samples, I've just started started using a fake name and address. These samples are for a short, introductory class that I'll be teaching in Redlands and Scottdale. 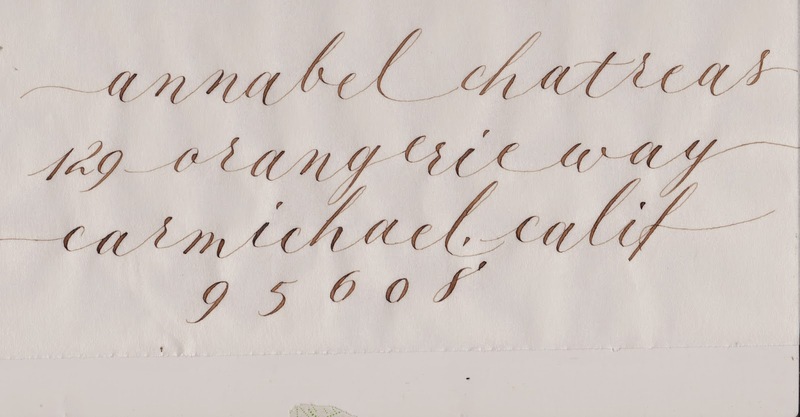 The class will be based on copperplate, but with less structure and lots of leeway for personalization. With only three hours, we'll cover lower-case, only, as well as variations. We'll start with a mono-line pen to draw the letters, as in the first example, then we'll move to a dip pen. We'll only have time for very simple decoration. I think this class will be a fun one and, hopefully, the students will be inspired to take more serious classes. I need to come up with more samples, as these were done quickly and sloppily, and especially because, later, I will be teaching another version of this class in Riverside which includes watercolor flowers. Happy Accident - ATC alternate version. While printing the backgrounds, I ran out of red ink. I liked the color combination. This scan is rather grainy--it looks better "in person". 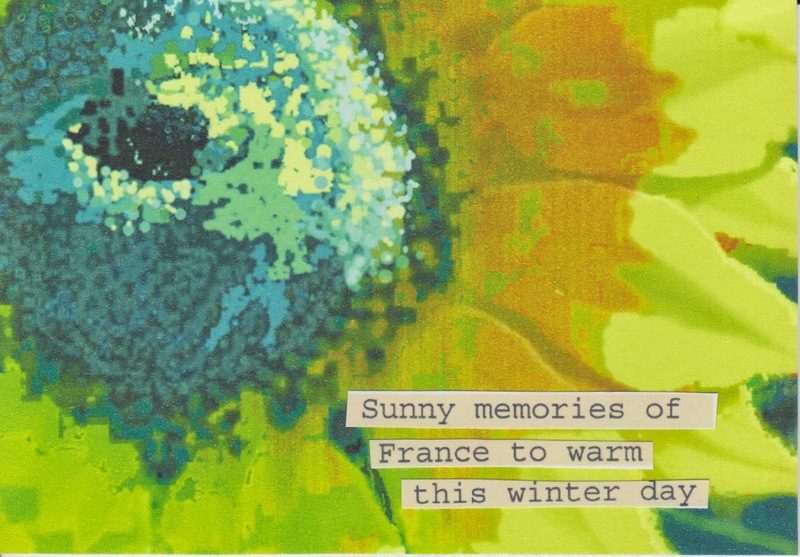 January's ATC. I played with Photoshop for this one--a great exercise for improving those skills. At the bottom is the original photo, taken while driving through the Loire Valley in France, during September 2011. 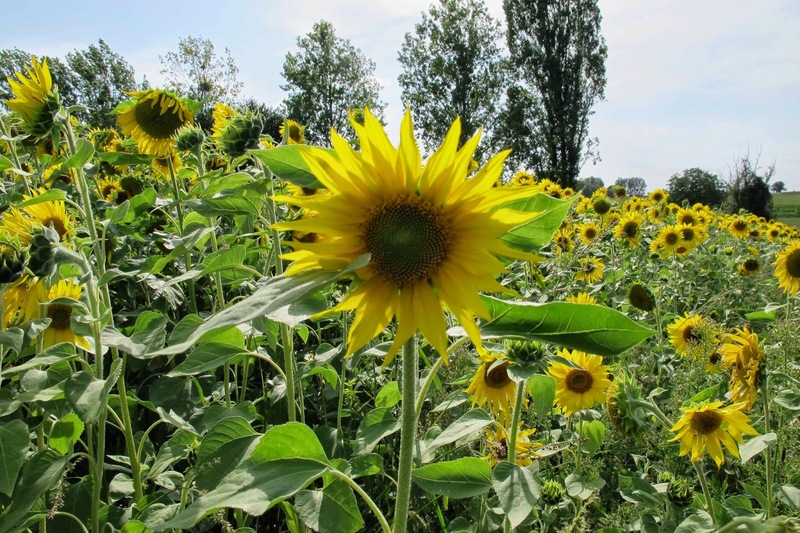 This was the only field of sunflowers in bloom that we passed during our entire three-week trip. All the other fields were brown and gone to seed. The photo was quickly snapped, without much effort to compose, thus, not too thrilling a picture. 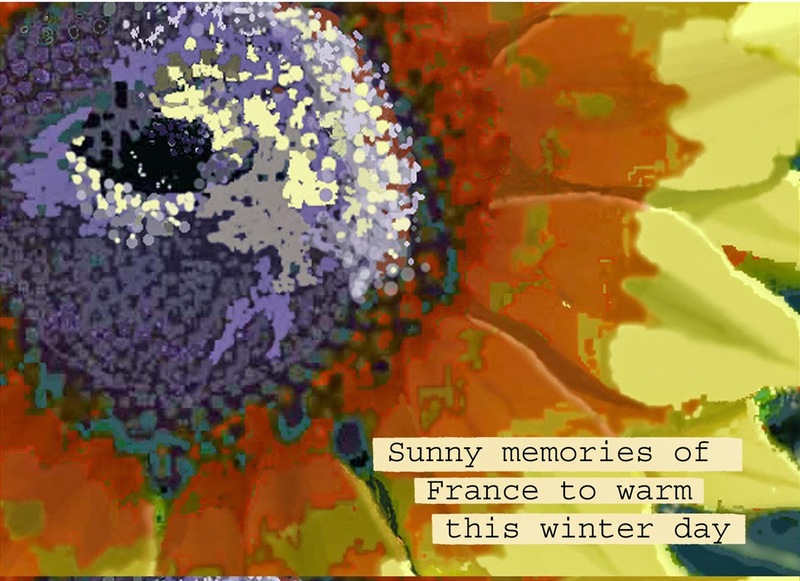 A design class project had these requirements: 1) Choose a photo; 2) Artistically crop it; 3) Change the colors. I chose to use Photoshop, as I'd like to improve my competentency. In the process of fulfilling the requirements, I also significantly altered the photo to change the shaded flower face into one which was light-filled. I finished that project in early December and was thrilled with what I had learned. The more I use Photoshop, the more I enjoy it. For this ATC, I have further cropped the project picture and I think I now like it even more. It appears I forgot to post my last ATC design. 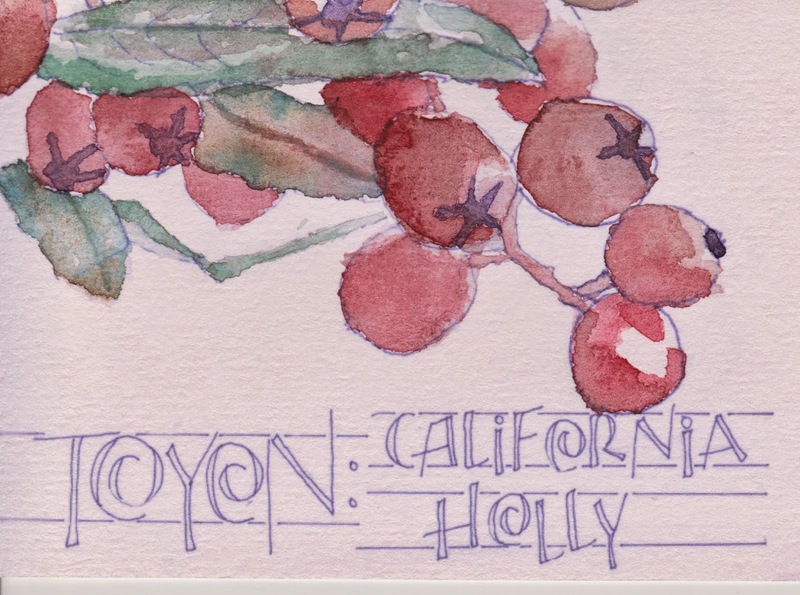 Although I was generally happy with the design--California Holly to reflect the then-upcoming season, I wasn't thrilled with the end result. I used fairly cheap watercolor paper and the painting didn't go well. I promised new versions to the exchange participants, and I hope to get to that fairly soon.